Zolten, producer of the GRAMMY-winning Fairfield Four and author of “Great God A’Mighty! The Dixie Hummingbirds: Celebrating the Rise of Soul Gospel Music,” is an associate professor of communication arts and sciences and American studies at the Pennsylvania State University at Altoona. 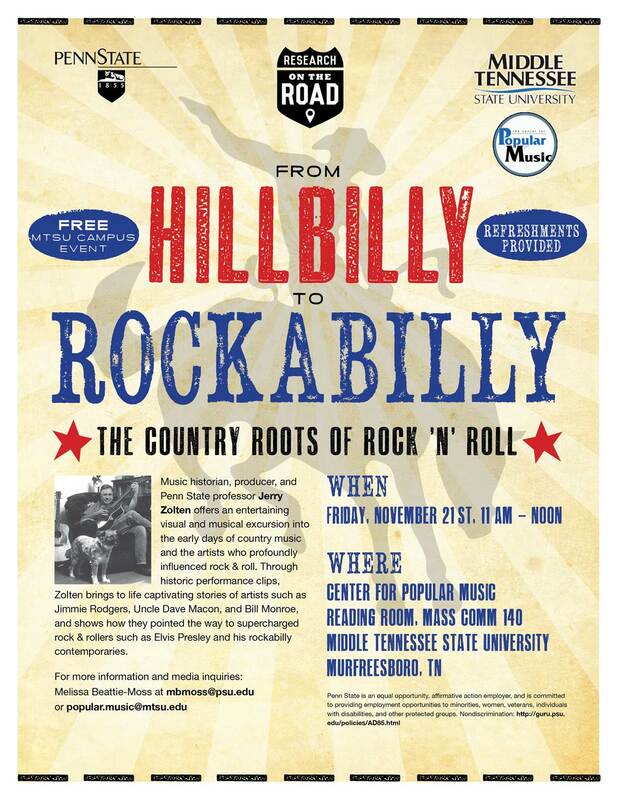 Among his specialties is American roots music, which also is a specialty of MTSU’s Center for Popular Music. Zolten’s talk included historic performance clips of artists such as Jimmie Rodgers, Macon and Monroe and showed how they pointed the way to supercharged rockers such as Presley, Carl Perkins and the like. The center, established within the College of Mass Communication in 1985 by the Tennessee Board of Regents as one of 16 Centers of Excellence across the TBR system, is devoted to the study and scholarship of popular music in America. Its staff maintains a unique archive of research materials that spans shaped-note songbooks to hip-hop mash-ups in a collection stretching from the early 18th century to the present. The center also develops and sponsors programs in American vernacular music and regularly presents special concerts, lectures and events like the Zolten lecture for the campus community. Zolten also lectured Nov. 22 at the Country Music Hall of Fame and Museum in downtown Nashville. Thanks to MTSU News and Media Relations.